Brighton Wellbeing massage therapist Barbara is a fully certified Clinical Massage Therapist with 14 years’ experience. Her speciality is effectively treating chronic pain conditions, combining many advanced clinical techniques which she has acquired with the Jing Institute of Advanced Massage Training in Brighton along with other effective therapies she has learnt in her journey as a holistic practitioner. Her treatments are long lasting and very therapeutic; they are suited to chronic condition sufferers, cancer patients and general public. As a certified holistic massage therapist, Barbara fuses multiple synergistic bodywork modalities in her treatments to help bring relief and relaxation to body, mind and spirit, in line with the law of physics (the whole is bigger than the sum of its parts). This multidisciplinary integration of techniques, that also include aromatherapy, meridian reflexology, Indian head massage, facial acupressure and reiki (fused together in her integrative massages), create bespoke treatments that address the complexities of each individual condition in its different layers, making the healing process quicker and more effective with long term improvements. 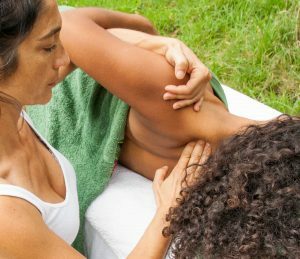 She believes that a massage therapist should understand that each person is a unique universe with his/her own rhythms and that the more techniques are used to tackle a specific health matter, the quicker the body will return to a stage of homeostasis. For this purpose she is on a continuum development journey to learn new techniques for body, mind and spirit that she can integrate in her sessions at Brighton Wellbeing. In addition to being a massage therapist in Brighton, Barbara works as an oncology aromatherapist at Montefiore Hospital providing oncology massage treatments and reiki to chemotherapy and post-surgical patients. These sessions are tailored to relieve secondary symptoms of cancer (nausea, insomnia, pain, depression and anxiety to list some) and promote relaxation and well-being in a safe and non-invasive way. Additionally, she is currently providing aromatherapy treatments to the staff, nurses and doctors at the Brighton Sussex Cancer Centre and at the Breast Cancer unit in Preston Park, Brighton. Her work also includes providing holistic therapies to elderly, HIV sufferers, mothers-to-be, and chronic sufferers across Brighton and Hove. She offers her treatments throughout Sussex in the comfort of your home, or in corporate and office environments, as well as in private events. You can find testimonials for her work from different NHS professionals here.